Lakeland Community College in Kirtland, OH serves over 20,000 students annually, and hosts just one graduation per year every May. This large celebratory event brings hundreds of students, faculty and their proud friends and family together in commencement. The entire event is held outdoors in beautiful tents, and Lakeland wanted to make sure that each part of the day’s festivities contributed to the excited mood of this great accomplishment. The college reserved four Elegance Series 10 Station luxury restroom trailers, including one ADA compliant trailer to meet the needs of guests. 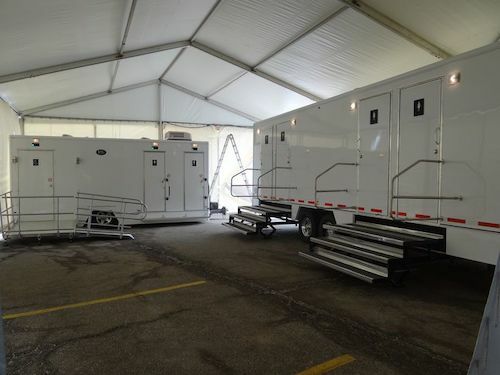 We delivered the units and set them up underneath a separated tented area to keep restrooms centrally located and accessible from the main event. The next day before pickup we pumped and cleaned the units so the college had nothing more to worry about after the last square cap was thrown. Take a look at our photos from last year’s graduation below! To learn more about luxury restroom units for your celebration, chat with one of our representatives using our Live Chat portal or request a quote below.